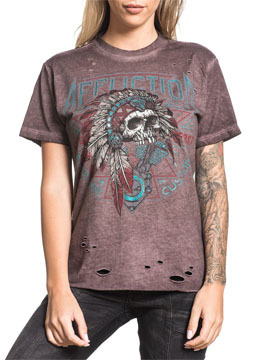 Affliction American Customs Silversmith womens short sleeve crew neck t-shirt features Affliction American Customs logo, Native American Indian chief skull, feather headdress, engine and laser cut holes on the front. The back features v-shape cut out and laser cut holes. Oil stain wash creates distressed and vintage look. 100% Cotton. light weight, raw seams, slim fit. Garment dyed with silicon wash for soft feel. Color: peppercorn brown.